1. Could you tell us the name of a book that you love, and why? I love Tan Lin’s Seven Controlled Vocabularies and Obituary 2004, The Joy of Cooking, but more than loving the actual, physical book, I love Tan Lin reading from the book, and probably even more than that, I love Tan Lin. When I worked as a shelver at the Denver Public Library for 10 months, I listened to Pennsound recordings like a fiend, but after awhile, the only satisfying thing to listen to on repeat during my eight hour shifts that consisted primarily of the quite boring task of numerically and alphabetically arranging books on shelves, was Tan Lin being interviewed or Tan Lin reading poetry and especially Tan Lin reading from Seven Controlled Vocabularies. This got me thinking about C.A. Conrad’s somatic reading exercises. Here is what I recommend to enhance your Tan Lin experience. Put Tan Lin on your ipod. Go to the nearest and largest public library you can find and spend the entire day putting books on the shelves. It is best if you live in a city. It is best if you know your dewey decimal system first, so you don’t piss off the librarians. Maybe you should watch the movie Party Girl to prepare. At the library you will find lots of carts full of unsorted and unshelved books. You may have noticed them before. To library workers they are complex and terrible animals. They are like herds of buffalo staring you down and as soon as you think you’ve defeated the herd, a new herd appears. This is quite upsetting. Often the actual shelvers are asleep or crying in some secret place in the library because of this. Maybe in the basement. You will have no problem taking over one or two or three of the carts full of books. It is best to be in the 641’s with the cookbooks. They are heavy and the pictures of food are endlessly fascinating and you will see, wonderfully enhanced by the voice of Tan Lin. I thought a lot more about landscapes and textures underneath and behind writing. I began making sensory dioramas that were inspired in part by the titles of the “I hate perfume” experiences by CB. I wrote poems or read books and then I made dioramas called “Experience 18: Tracking a Deer,” “Experience 6: Gathering Leaves in Winter,” “Experience 78: Cyborg Siluetas.” I wanted each diorama to have a representation of each of the five / six senses but none of them ended up having that. I listened to more recordings and thought about which settings were best for each listening. I discovered that Hannah Weiner is not good in the library stacks, but is wonderful when eating lunch under a pine tree. Caroline Bergvall, Cecilia Vicuna, Bhanu Kapil and Lisa Robertson transcend every setting. I thought about why Tan Lin would choose Laura (Riding) Jackson to write the preface for his book. The preface is directly photocopied and placed more toward the middle of the book, not at the opening, and of course, LRJ has no idea she wrote the preface for this book. It’s from Rational Meaning, her enormous project after the renunciation of poetry, the bizarre linguistic search for rationality in language that fails even more miserably than she thought poetry failed. I thought about how Tan Lin pushes poetry to the edge of failure (by wanting it to be “boring,” by plagiarizing, by tearing down the constraints of the book) and then pushes it more so that perhaps poetry does fail but out of that failure is made more wonderful and redeemed, so that it rises from the ashes and is poetry again. This line resonates completely with the “in the library” experience. Once in a performance class taught by Lin Hixson we were asked to perform an experiment that consisted of walking very slowly in the Art Institute of Chicago. We were supposed to take only one step per minute. This is a fairly covert thing to do in a museum setting, but nevertheless it did alter the paintings. Depending on how you landed for the duration of each particular minute, you might only be able to see a corner of a painting clearly, or you might be right on top of it so you only get a single detail, or you might be so close or so far away that you can’t really see anything at all. On the day that I did this the museum was almost completely empty, but at some point I had to maneuver between two people and a doorway. I moved slowly, beneath the crossfire of their conversation and somehow they didn’t seem to notice a thing. I remember thinking, perhaps this activity has rendered me invisible. Perhaps I’ve metamorphosed into a peripheral animal. I imagine that Tan Lin meant something like this when he wrote “it is best to behave like an animal or an insect while reading.” It is best to enter into a space of reading that allows you and the text to become indistinguishable. I sent links to the recordings of this book and the book itself to Isaac Linder, a writer, musician, and shelver at the public library. 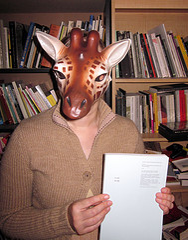 Bio: Andrea Rexilius completed her PhD in Literature and Creative Writing at the University of Denver. She is the editor of the online journal Parcel, and co-editor of Marcel. She used to belong to the Denver Quarterly. Her work has appeared in How 2, P-Queue, OR, Play / No Play, Trickhouse, and elsewhere. She has a chapbook on Horse Less Press. Her first book, To Be Human Is To Be a Conversation will be published in April 2011 by Rescue Press. A second collection is soon to follow from Letter Machine Editions. This entry was posted in Safety Book. Bookmark the permalink. and in that way the sub-visible circulation of 7CV will continue unimpededly throughout the DPL Shelving cabal. Wonderful interview, Andrea! You were wise to choose her, R+P!